Podcast » Podcast #65: Deer, Rabbit, Bobcat, Habitat. How Do They Correlate? 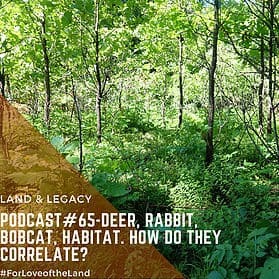 Podcast #65: Deer, Rabbit, Bobcat, Habitat. How Do They Correlate? This week you are going to find out how deer, rabbits, bobcats and habitat all work together! Before you download the podcast be sure to watch the trail camera video above. This unique encounter provides the basis for our podcast discussion. Predator- prey relationships are incredibly dynamic! If we stop and think about it, we can all agree that if one thing changes among, the predator, prey, or the habitat, that they might all be affected.